Mosta is one of the larger towns on Malta. It lies in the middle of the island, and is a town you are likely to pass, when traveling from the south to the north (or vice versa). The town is most famous for the Mosta Dome. 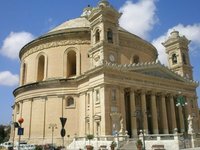 Rotunda of St Marija Assunta, also known as Mosta Dome, is a stunning church in Mosta. Built in the 19th century its dome is the third largest in the world with a diameter of 37 metres. The construction of the church was not completed until the 1860s, but while it was being built the old church was left in the center and torn down upon completion of the new dome. On April 9, 1942 a 200 kg bomb was dropped on the dome by a German bomber and broke through the dome but did not explode sparing the lives of over 300 people awaiting for an evening mass. A replica bomb is now displayed as a memorial. If you look closely to the time that is being displayed on the two towers of the church you will see that one of the clocks is displaying an incorrect time. This is done to mislead the devil, and is a common habit you will find also in other places on Malta. The Victoria Lines are defense lines that runs across the island for 12 kilometres. They were built in the second part of the 19th century, and abandoned in 1907, as warfare had been modernized. Near Mosta lies a fort that was part of the Victoria Lines, and which has been restored and can be visited. It is also possible to make a walk along the complete 12 kilometres. The feast of Saint Mary the Assumption is celebrated on the 15th of August, it is a popular event with the residents and tourists alike. The Malta International Airport in Luqa is home to the national airline, Air Malta. Air Malta has regular connections to destinations in Europe, Africa and Middle East. Some other regional airlines flying into Malta include Air Méditerranée, BritishJET, MyTravel Airways, Ryanair and Thomsonfly. From the airport you need to continue by bus or car to Mosta, which lies about 10 kilometres to the north-west. There are no train services on Malta. There are numerous international and local companies that offer rental cars and you can pick them up at the airport, dowtown in Valletta and also in smaller places where there are hotels. Most roads are paved an in a regular shape, but the driving skills of locals are not. Although the mortality rate in traffic is the lowest in the European Union (source), it pays to be a careful and defensive driver! Remember that traffic drives on the left in Malta and be sure to have an international driving permit. The prices of rental cars are among the cheapest in Europe and own transportation is the preferred method for most tourists. As a general rule, make sure that if you do hire a car in Malta the vehicle is checked for physical damage in the presence of the car hire representative. That helps avoid nasty surprises upon returning the vehicle. Bus routes 21, 23, 31, 41 and 42 run from Valletta through Mosta. Routes 103, 205 and 244 run from other locations through Mosta. Schedules and timetables can be found at the Arriva Malta site at Arriva Malta. This is version 13. Last edited at 14:36 on Nov 13, 13 by Utrecht. 2 articles link to this page.